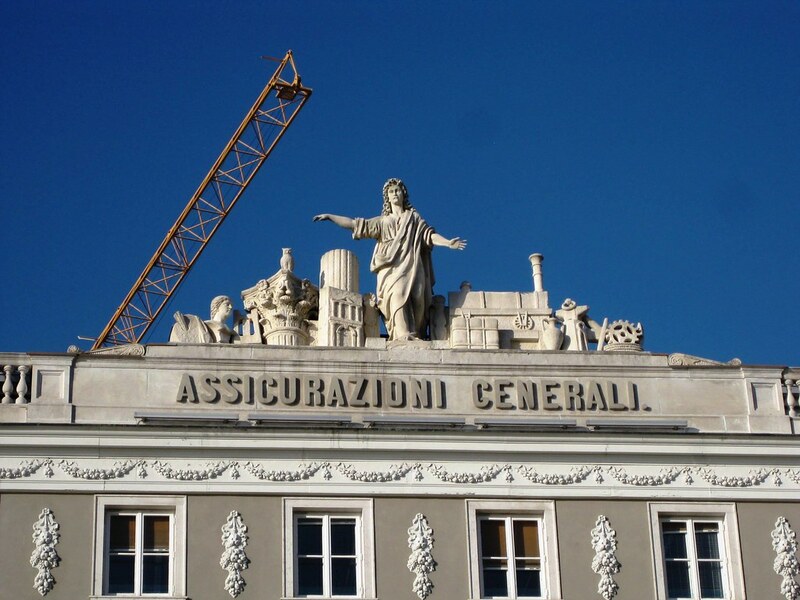 I recently visited Brescia Italy on a business trip. I had some extra time since I travelled by night train and so took the opportunity to explore the city. Brescia is a relatively small city in the northern part of Italy about an hour from Milan on the main railway route between Milan and Venice. I stayed in the Hotel Vittoria, a classic hotel in the centre of Brescia. It was my favorite type of hotel: old but very clean and well maintained. The breakfast was excellent with great coffee and a German style buffet (with Italian foods!). I decided to visit the Santa Giulia museum (home page in Italian only, odd for a tourist destination, but all the information in the museum is provided in English and Italian). This museum is built on the site of a former abby that was founded in the 700s. Brescia was an important Roman town and getting to the museum you pass the old forum and ruins of the Forum Temple and Roman theater. The Santa Giulia museum covers the city’s history from pre-historic times until the present. The city brought items found throughout the city to the museum for viewing. The museum is quite cool because it uses the old abby buildings to show the history. You walk through several eras of history in the different chapels that are on the site. Artwork from the appropriate age is displayed in the chapels and connecting structures. In between you can look out on the classic abby courtyard. The museum has some real treasures including a precious stone embedded cross (Cross of Desiderius, late 8th Century) and unbelievable medieval frescoes in the Santa Maria in Solario chapel. Then, because the abby was built over part of the old Roman city they have a large indoor space where you an look down on several remarkably well preserved Roman houses. The frescos and mosaic floors are incredible to see. 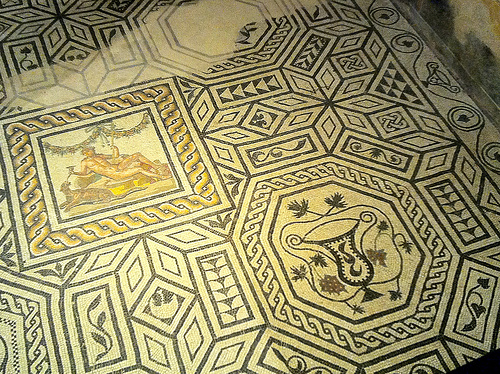 I took lots of photos, the better ones are on my Flickr photos of Santa Giulia Museum. There are also lots of examples of everyday objects from the Roman era. The transport planner in me liked the milestone markers and the sections of Roman roadways that they left intact for us to see. I would highly recommend the museum for those interested in seeing Roman city planning history and medieval art, two things I really enjoy. 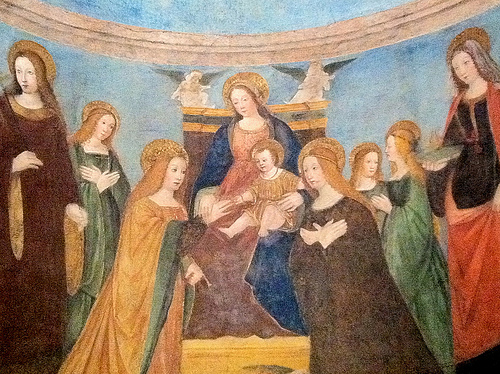 My photos of the Santa Giulia Museum Brescia on flickr. 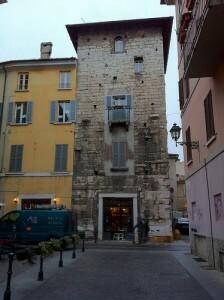 In the ground floor of this old tower is a charming cafe serving simple food and great drinks. 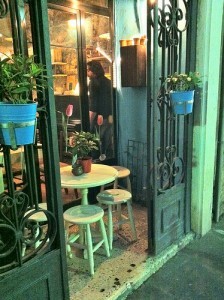 Like most all Italian cafes they offer free snacks during happy hour. They have great beer including Belgo from Belgium and I even saw a bottle of Sierra Nevada (one of my favorite US beers) on a shelf. I visited twice, the first time I had a Campari soda (very Italian of me) and the second time a very tasty draft Brat beer. 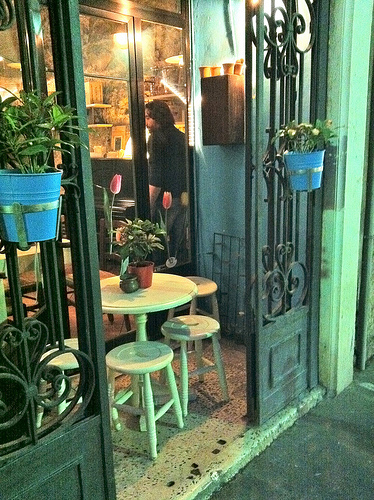 They have a few tables in a little square across the street, and even have an ingenious solution for smokers, a little table and chairs placed in an alcove in the street with windows into the cafe (see photo). They had music the second night I visited, this is the kind of cafe everyone needs nearby! There were several very interesting shops nearby. A wonderful design and antiques store across the street, a “hat laboratory” a little way down the street, a wonderful pasta store, a garage with a marble floor, an architectural office with a neat tape measure art piece in the window. A really fun street with lots of creative people around. See all my photos of Via Carlo Cattaneo on flickr. There are also lots of interesting buildings in the historic center including the Loggia (my photos of the Loggia on flickr), the official city hall, which was designed by several famous architects including Pladdio, and the Cathederal. Also lots of nice squares, many of which have been turned into pedestrian areas. Brescia is part of the EU funded CIVITAS project and they are doing lots of interesting work on sustainable transport. Brescia has a very nice bicycle rental system, good public transport (they are building a tram line through the center of the city, partly underground) and a unified smart card for public transport, car sharing and bicycle rental. Very impressive for a relatively small city (about 250,000 in the city and a million in the region). All my photos of Brescia on flickr. 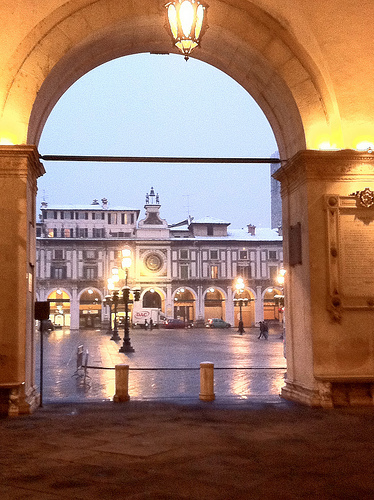 In summary, Brescia is a nice city to visit, especially so because it’s off the main tourist path. I recently travelled to Brescia Italy on a business trip. 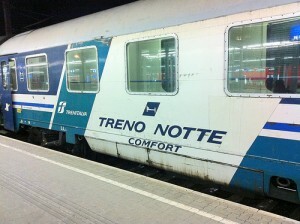 I decided to take the night train since Brescia is right on the route between Vienna and Milan. My wife and I used to take the night train often between Zurich and Graz or Vienna, but it’s been a while since my last trip. There’s lots of variation between night train services. The Italian night trains seem to be pretty spartan. On the trains between Zurich and Graz/Vienna you get breakfast and often a welcome drink, on the Italian train I just took, nothing. So be sure to bring your own snacks, water or other drinks – always good advice when traveling by train! My trip was during the long cold spell we had at the end of January, and, unfortunately, after about an hour the sleeping car attendant realized that the heating in our car was not going to be working. So he moved us all into one of the other wagons. I had booked a single in the sleeping car and unfortunately there was only one sleeping car on the train. So I was moved into a couchette car. 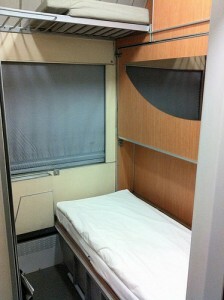 There are two types of sleeping cars: a real sleeping car that has 1-3 fairly nice bunk beds and a sink in the compartment (Schlafwagen in German) or a couchette car that has 4-6 narrower bunks (with less nice bed linens: one of those sheet sacks with a blanket as opposed to a covered duvet) and no sink. There’s quite a difference in cost, but not as much as you might think. Also, note that you can usually get a couchette in a 4-person compartment or a 6-person compartment, always choose the 4-person, it’s only a little more expensive. It was no fun to be in the couchette since the bed was only barely wide enough the lie flat and I hate the blankets/ sleeping sack arrangement, but at least it was warm. It was lucky that the train was fairly empty (a Monday night in January), so I still had a single. We arrived on time in Brescia and I walked to my hotel where I had a wonderful breakfast and they let me check-in early, a real treat. An aside about breakfast, on the Zurich-Graz/Vienna night trains they used to give you a choice between having breakfast on the train or taking it with you (Austrian arrivals) or getting a voucher for breakfast in a restaurant in the Zurich train station. My recommendation: always get the breakfast to take with you or the voucher … you will get about a half-hour more sleep. One more thing: in Austria when you have a sleeping car ticket you can go into the “Business Lounge” which they have in many stations. You can have a glass of wine or beer before your trip begins or breakfast (real coffee and a roll) in the morning. It’s another nice feature of traveling by sleeping car. 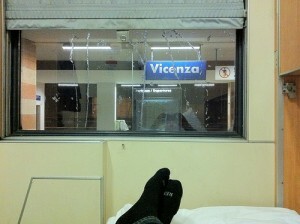 Vicenza station from my sleeping car bed. I stayed one night in Brescia, and two days. The night train arrived at 7:30 am on Tuesday and I returned on the night train that left Brescia about 10:00 pm on Wednesday. The return train was nicer since the heating was working so I was able to have my single. Unfortunately, the train was delayed quite a bit (there was a snow storm), so we reached Vienna about 45-minutes late (9:20 am on Thursday). I was inspired to write this by a nice article about Europe’s 8 best night trains on the Lonely Planet website. 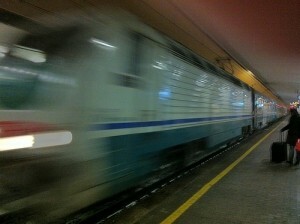 More photos of my trip on the Italian night train on Flickr. 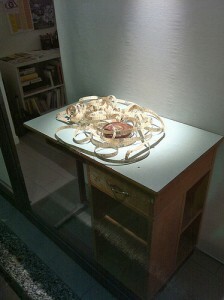 I helped with the Slow Food Terra Madre in Vienna last fall. 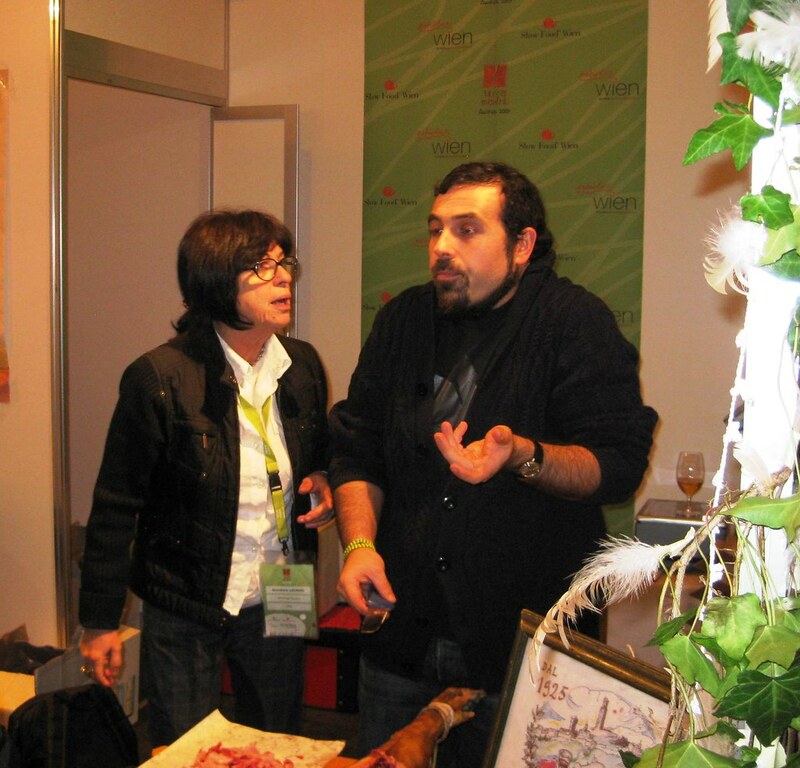 My job was to help make the group of vendors from Italy feel at home (I know, tough work, but someone’s got to do it!). 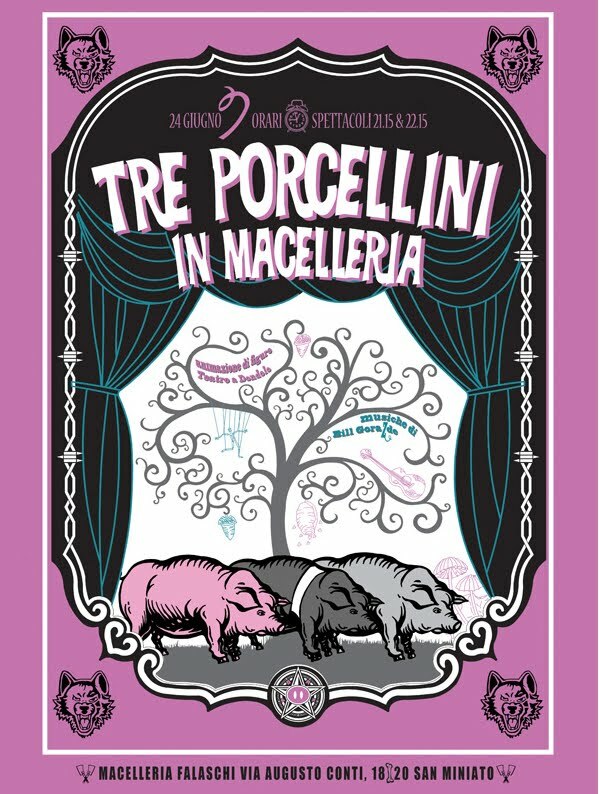 The Sergio Falaschi’s Butcher, this year at the international exhibition of street theater “La Luna è Azzurra” in San Miniato, has decided to offer a show of puppetry, inspired by the Group ” Teatro a Dondolo” from Pisa, based oa reinterpretation of the Three Little Pigs story, inspired by the three figures of pigs raised in the wild state, the ones rised in the semi-wild state and the pink pig raised in stable. The show will be accompanied by a live musical performance, conceived for the occasion by “Bill Gorazde”. 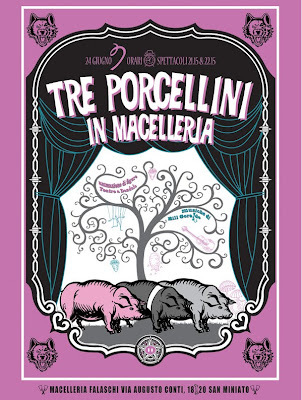 During the the show, entitled ” I TRE PORCELLINI IN MACELLERIA” (The Three Little Pigs in the Butcher shop), a tasting of three different types of salami will be offered to the public: The Cinta Senese Dop (from pork raised in the wild), the Grey (from pork raised semi-wild state) and classic Tuscan salame with wine (from pink pig raised in stable). The salami tasting will be all accompanied by “Annick” and “Nicole” wines by Cosimo Maria Masini. …….We kindly require adults to be accompanied by children…………. The evening event will be held on Thursday, June 24. The performances will start at 21:15 and 22:15.